…The golden sands of the South coast of England awaited some of our athletes on Sunday at the Weymouth 70.3. With blue skies, 18 degrees in the sea (I did not know our waters could get that warm) and little wind the inaugural Ironman 70.3 and Full races were bound to be a success. There were 5 ladies in the female PRO female including our very own Hannah Drewett. Jenni Muston and Colin Hill raced in the age group fields – sadly Colin had to pull out of the race due to illness (we hope you are better now Colin). With the Pros off just before 7am (two of the ladies might I add from Yorkshire! ), the age groupers started on a rolling start immediately afterwards. The sea was like the Med with one loop for the 70.3ers and an Australian exit for the Full-ers. Transition was a bit of a run away before out onto the rolling, unforgiving hills of Dorset – which were stunning. The bike leg was a working one and continually broke athletes pace – nobody seemed to mind – it was beautiful. Onto the flat as a pancake run along the crowd lined seafront with 2.5 loops along the Esplanade and through the town. By this time the sun was beating down and we were all topping up our tans. 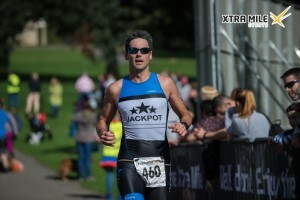 A really lovely race…but we did have the weather on our side (unlike Vitruvian!). Hannah had a brilliant race and finished as 3rd lady overall in 5 hours 1 minute – Hannah’s swim was exceptional – 7th overall (inc. men I mean overall) out of the water – she swam 25:02 minutes, biked 2:51 on a week old bike (! ), and ran a 1:37 half. Many, many congratulations to you Hannah! Jen didn’t do too bad either 😉 Jen was 12th lady overall, 1st in her age group (40-44), swim 34 (I’d like to say I was enjoying the swim too much and didn’t want to get out of the water looking at Han’s swim time but this would be a blatant lie! ), biked a 2:53, and ran a 1:38 half – and wants to do the race again next year! The Vitruvian Triathlon sparkled with gold through the pouring rain for Will Cowen as he smashed his way to a fantastic win in 3 hours 54 minutes! A full 4 minutes ahead of 2nd place! Will’s stats (watch and learn people): 24:10 swim (1.9k), 2:07:24 bike (52 miles), 1:20 run (21k). A brilliant race and win! Will is now crowned as the National Champion for Middle Distance 2016! Many congratulations Will! Fast finish for Gordon at Leeds!